Last week on Arrow, we got the second half of the 2-night crossover event, which had the two camps hiding out in the country. Oliver (Stephen Amell) ran a secret DNA test through Barry (Grant Gustin) and “It’s a boy!” Felicity (Emily Bett Rickards) found out and their relationship seems over. They meet Savage (Casper Crump) with a plan and everyone dies, except Barry. 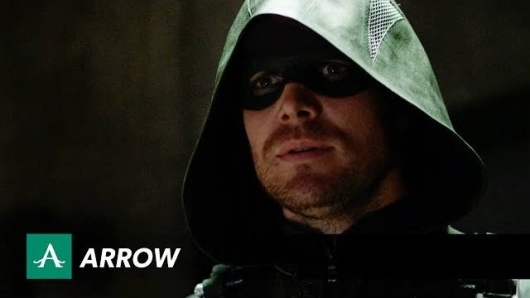 HE runs back in time, and tells Oliver, who makes a different plan in both Savage strategy and Felicity strategy. The second part of the 2-night crossover event aired tonight in the Arrowverse. Arrow, two weeks ago, had Diggle (David Ramsey) and his H.I.V.E, not-dead-just-brainwashed brother fighting, as his brother was part of Damian Darhk’s crew. Thea (Willa Holland) was able to cure her bloodlust temporarily (and accidentally) via Darhk (Neal McDonough). Last night on The Flash, Vandal Savage (Casper Crump) was introduced as the biggest bad of them all – a 4,000-year old immortal with a perpetual murderous focus on Hawkman and Hawkgirl (Falk Hentschel and Ciara Renee). Hawkgirl aka Kendra has to jump off a building to open herself up to her powers. Cisco (Carlos Valdes) is kinda pissed Hawkman is moving in on his girl. Dr. Wells and Caitlyn (Tom Cavanagh and Danielle Panabaker) develop a speed drug, which Jay Garrick (Teddy Sears) has to take to save Dr. Wells life. 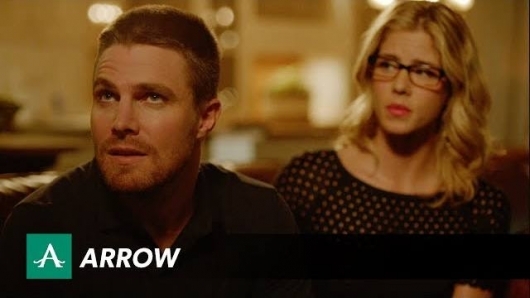 Oliver (Stephen Amell) realizes he may have a kid. I have been waiting for this since season 2! Do not proceed any further if you haven’t watched the “Legends of Yesterday” episode yet. Serious spoilers! 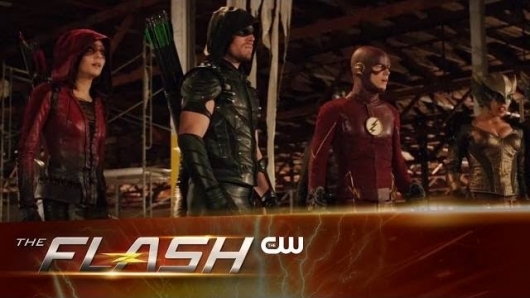 Watch ‘The Flash’ & ‘Arrow’ Crossover Trailer! 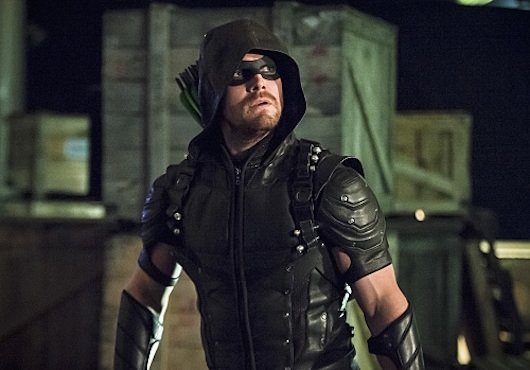 Arrow and The Flash are skipping Thanksgiving week next week, and we will all be quite sad. However, beginning with The Flash on Tuesday, December 1st, and continuing on Arrow on Wednesday, December 2nd, comes the 2-night crossover event we’ve been waiting for since the season began. Crossovers between these two shows were the highlights of last season for both of them. We’ve had some guest appearances, but nothing like this. Watch the extended crossover trailer here below. 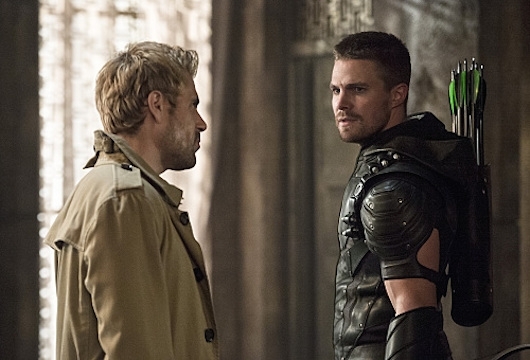 Last week on Arrow, John Constantine guest starred! It made me indescribably happy to see Matt Ryan on the show, not only in present day Star City, but also in the flashbacks in Lian Yu, finally making that storyline a hell of a lot more interesting. 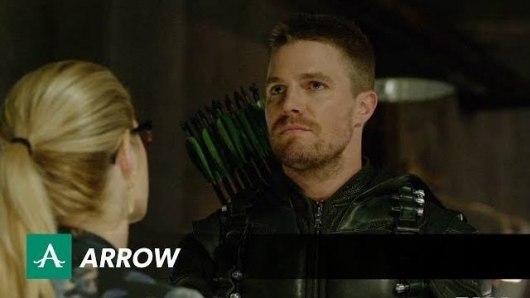 After Oliver (Stephen Amell) finds out that Sara (Caity Lotz) is alive but soulless, and out to kill Thea (Willa Holland), he calls in a favor from a friend. That friend is John Constantine, whose life Oliver saved back on the island. Constantine takes Laurel (Katie Cassidy) and Oliver into the other realm to fight for Sara’s soul, and they win. The Lance family has a tearful reunion. Holt (Echo Kellum) discovers that Ray Palmer (Brandon Routh) is alive! 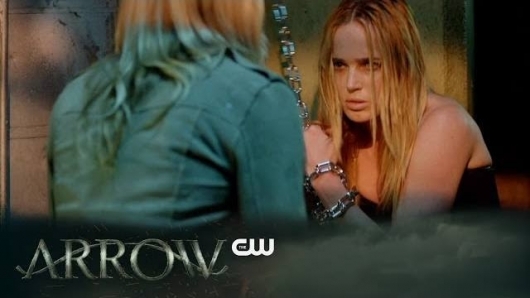 Last week on Arrow, Laurel (Katie Cassidy) showed Lance (Paul Blackthorne) that Sara (Caity Lotz) was alive – chained up, animilistic, wildling, but alive. He goes to Damien Darhk (Neal McDonough) for advice who seems almost a friend, and advises him to put her down. He almost goes through with it in a heartwrenching moment, but Laurel is able to talk him down. At the end though, Sara escaped. Felicity (Emily Bett Rickards) is still not getting the hint that Ray is trying to communicate with her through her phone, even though Holt (Echo Kellum) tells her it’s coming from inside Palmer Tech. She is reluctant to listen to Ray’s last words but gives in. There was a little storyline involving corrupt cops, but I felt like that was background to the other stuff. 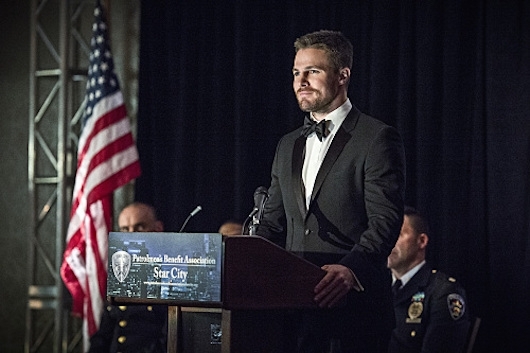 The gang has a new lair, and after some hemming and hawing, Oliver (Stephen Amell) formerly announced his candidacy for mayor of Star City. 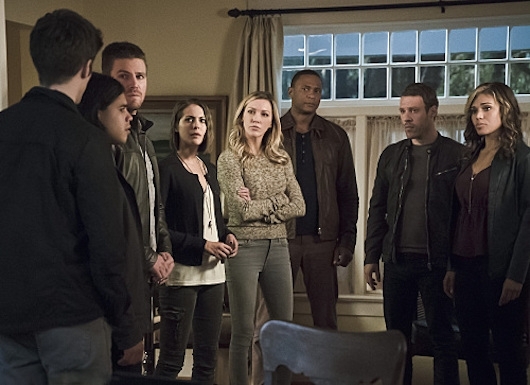 Last week on Arrow, Thea and Laurel (Willa Holland and Katie Cassidy) go to Nanda Parbat to get Malcolm Merlyn (John Barrowman), the new Ra’s al Ghul, to restore Sara (Caity Lotz) via the Lazarus Pit. Thea also wants to cure the beast inside her. At first Merlyn says no to the pit, and lies to Thea about helping her. Once he tricks her into killing to slake the bloodlust, she is so furious, he agrees to resurrect Sara. Because of all this, Nyssa (Katrina Law) destroys The Lazarus Pit. That was wise. Sara comes out of the Pit, a wild animal, bent on destroying Thea (her killer). That’s a tidy reason why she will need to leave to join Legends of Tomorrow. Diggle and Oliver (David Ramsey and Stephen Amell) squash their issues, Diggle finally admitting his secret 2-year investigation. Felicity was so pro team, I thought surely someone was going to be in critical condition by the end of the episode. Thank goodness, no one was. A killer-by-playing-card meta ran around town, and was the means by which newcomer Holt (Echo Kellum) finds out about her other job (but not about Oliver’s identity… yet). Superhero season is officially back! Yesterday kicked off with The Flash, and tonight it’s time for its darker cousin, Arrow. 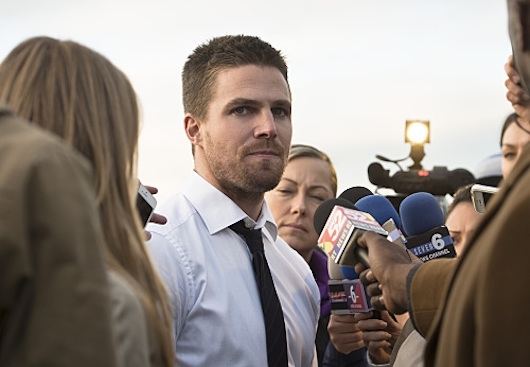 When we last saw Oliver Queen aka Arrow (Stephen Amell), he was happily driving down a sunny road, away from the chaos and towards his new happy life with Felicity (Emily Bett Rickards). Matt Nable‘s Ra’s al Ghul was defeated, and Malcolm Merlyn (John Barrowman) took his place. Thea (Willa Holland) embraced her inner superhero in her red leather outfit, after her boyfriend Roy Harper (Colton Haynes) left town. It looks like Ray Palmer (Brandon Routh) exploded (but we know better), and Diggle (David Ramsey) and Laurel (Katie Cassidy) are still in town fighting crime, most likely against her anti-vigilante father Lance’s wishes (Paul Blackthorne). We all caught up? Don’t read on unless you’ve watched the episode, for spoilers lie ahead.